Have you ever seen a blue German Shepherd? It's true - there are German Shepherds that are blue. 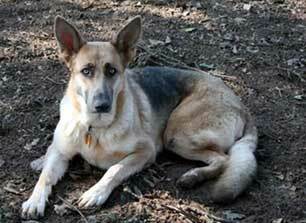 In fact, German Shepherd Dogs come in various colors and also in a lot of different color patterns too. So you may see various colors of GSDs such as the white German Shepherd, Solid Black German Shepherd, maybe even a black and tan or black and red as well (to name a few). If you've never seen one of these dogs just imagine that everywhere there is black on the GSD normally, that you now see kind of a dusty gray color. And everywhere there's normally a nice black color on a German Shepherd, in the case of the blue German Shepherd, it would appear really washed out - kind of a gray color or almost blue looking in appearance. But it's true, there are blue German Shepherds - but this color is not one that you will see very often. In fact, according to bring specifications, a blue German Shepherd is very rare but this is also considered to be a fault of confirmation. Reputable GSD breeders do not breed for blue or liver colored German Shepherds - blue is not considered a standard color of the German Shepherd Dog - but it does happen from time to time. And what that means basically to regular folks is that you could not show a blue GSD in any kind of confirmation dog show if you were into showing German Shepherds. But if you had a German Shepherd as a pet, and it just happened to be blue - well then, that's no big issue at all to worry about. In some cases the blue might look kind of dusty like someone spilled flour on the dog's coat but then again in other cases it might be more of a darker gunmetal color. In fact, in an otherwise Saddle back pattern, instead of your dog being a "regular" black and tan, if it were a blue dog, it would be considered a blue and tan. But don't let the blue color scare you away. As in the case of any other German Shepherd Dog, a German Shepherd that happens to be blue is still a very handsome animal. And Blue German Shepherds can easily be born into a litter of otherwise standard colored German Shepherd puppies. For this to happen in the first place, it's all down in the genes. Both parents have to carry this recessive "Blue Gene". Kind of the same as if you had a solid black German Shepherd or a solid white German Shepherd Dog. In those cases also, both parents have to carry the gene for solid black or solid white in order for you to produce any solid black or solid white German Shepherd puppies in the litter. 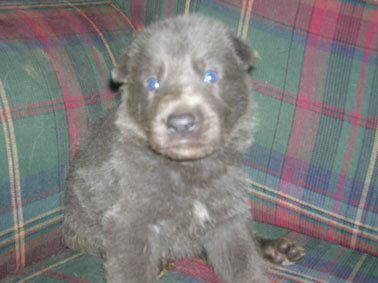 When born, the blue GSD puppies have very light baby blue eyes. And in most cases a blue colored GSD puppy will retain its blue eye color for a much longer period of time than any other color of German Shepherd puppy. And typically, as they age, the color turns into a more golden color. Health wise, it does not seem that the rare blue GSDs have any other major health issues than any of the other colors of German Shepherd dogs - so that's good to know. So if you were to get a blue German Shepherd puppy, it's good to know that it shouldn't have any other major health issues than any other, "regularly colored" German Shepherd dog. So all in all, a blue GSD can make a great pet. Plus, the number of health issues is no more than in any other color of German Shepherd. So if you follow my basic rules for choosing any German Shepherd dog in the first place, then you will remember that color is always the last thing that you should take into consideration when choosing any puppy or dog to bring into your home. And that applies to blue GSD puppies as well.